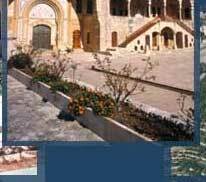 Beiteddine, "House Of Faith", is Lebanon's greatest treasure. 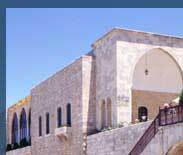 It is known for its palace which was built by Emir Bechir II Chehab. The palace reflects the typical oriental architecture of the 19th century. It took thirty years to be build. 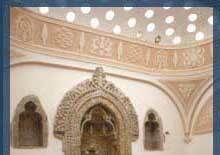 It is remarkable for its glamorous arcades, multicolored mosaic floors, reception rooms, harems, hammams and even by its guest house "Diyafa" where passing guests were lodged (French poet Lamartine stayed once there). Furthermore, visitors were mostly fascinated by the palace museum, since it exposes the Canaanite Phoenician works of art, a wide collection of Middle Ages arms, traditional costumes and Jewellery, mainly in silver. From Beiteddine, Emir Bechir II started the reorganization of his country and introduced many reforms. 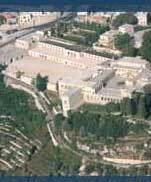 Beginning in 1943, the year of Lebanon's independence, the palace became the summer residence of the president. Bechara El Khoury was the first president to use Beiteddine and he brought back the remains of Emir Bechir from Istanbul, where he had died in 1850. 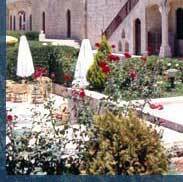 Today Beiteddine, with its museums and its gardens, is one of Lebanon's major tourist attractions. 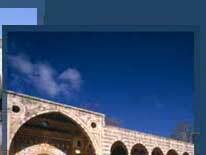 Beiteddine holds every year the Beiteddine Festival where Cesaria Evora, Elton John, Majida El Roumi, Stomp, Montserrat Caballé, Andrea Bocelli, Joe Cocker, Placido Domingo, Kazem El Saher, Notre Dame de Paris, and many more talented artists performed throughout the years. For more information: www.beiteddine.org. Few minutes from Beiteddine rises the Emir Amine palace, one of the most beautiful hotels in Lebanon which has an exceptional view that cannot be obstructed. 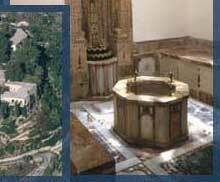 It was built for the emir's son, Amine.